Hebrews 10:22 reminds us to continue pursuing God: "Let us draw near to God with a sincere heart in full assurance of faith," and Apples of Gold helps you remember these words with a expertly crafted small gold cross pendant. This pendant is wrought from the highest quality of 14K yellow gold, which gives that warm color to the piece. The design is a simple silhouette of a cross that is open in the center for a unique take. This gold cross pendant is simple but powerful in its beauty and its reminder to draw ever closer to God. 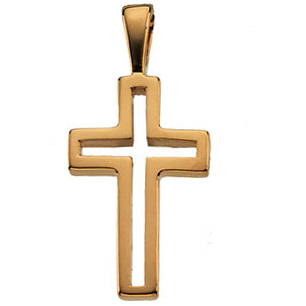 We guarantee our 14K Yellow Gold Small Cut-Out Cross Pendant to be high quality, authentic jewelry, as described above.